Korean law permits only ethnic Koreans or those married to Koreans to work as housekeepers. 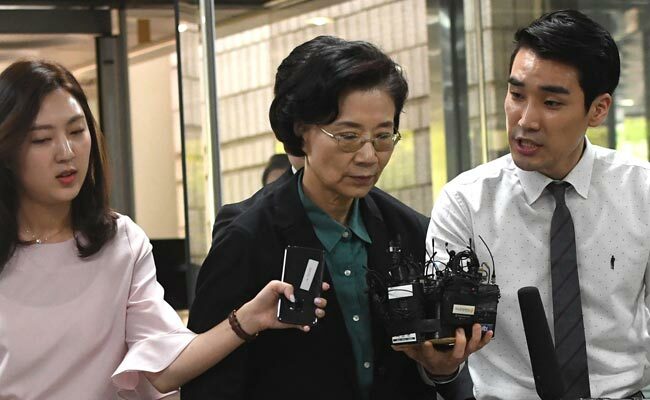 Seoul: The matriarch of the troubled Korean Air dynasty was grilled Monday over allegations she used company resources to illegally hire foreign housekeepers, as a probe into the scandal-hit family widened. Lee Myung-hee, 69, who was questioned by police twice last month over multiple assault allegations, was interrogated by immigration authorities over suspicions she hired more than 10 Filipina maids to work at her family home on false pretences, by claiming they were working for Korean Air. The authorities suspect Lee had the airline's human resources department and its Manila branch recruit the housekeepers and provide the Filipinas with documentation. "I didn't," she replied to questions on whether she ordered Korean Air officials to hire the housekeepers, removed evidence by letting them leave the country after the allegations emerged, and had bought their silence. "I will cooperate closely," she told journalists after she appeared at the Korea Immigration Service. A week earlier a Seoul court turned down a request from prosecutors to arrest Lee over multiple allegations of assault against drivers, housekeepers and company employees as well as construction workers renovating her home and building a Korean Air-affiliated hotel. The alleged abuses range from cursing and screaming at employees to kicking, slapping and even throwing a pair of scissors at them. A video that emerged last month showed a woman, reportedly Lee, shoving a female construction worker and throwing a pile of documents on the ground. But the court said there was a low risk of Lee fleeing or seeking to destroy evidence, and that the charges were disputable. Lee and her family have found themselves the object of public anger following a series of scandals. Lee's two daughters, who held management positions at South Korea's national carrier, became viral sensations for temper tantrums which were dubbed the "nut rage" and "water rage" scandals online. Her older daughter Cho Hyun-ah made global headlines in 2014 for kicking a cabin crew chief off a Korean Air plane for being served macadamia nuts in a bag rather than a bowl. She later served a short prison sentence. Earlier this year, the younger sister Cho Hyun-min was accused of throwing a drink at an advertising agency manager's face in a fit of rage during a business meeting. Their father, Cho Yang-ho, issued a public apology over the "immature" behaviour of his offspring and removed his two daughters from their management roles. Authorities have since launched a flurry of official probes into the family's reported abuse of workers, as well as allegations of smuggling and violations of immigration law. Cho Hyun-ah was questioned for 15 hours until early last Tuesday by tax authorities as part of an ongoing investigation into allegations she used Korean Air flights to smuggle foreign luxuries.